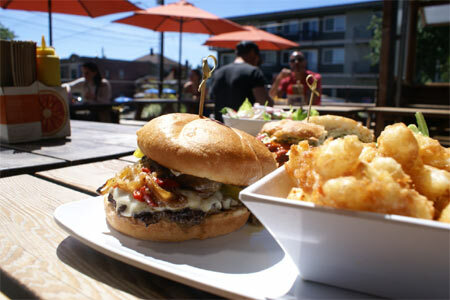 Chef-driven burgers in Seattle's Fremont neighborhood. : The name says it all: Uneeda Burger. Who are we to argue? Chef Scott Staples, whose restaurant group also includes Quinn's Pub, Sole Repair and Feed Co. Burgers, has created several options, ranging from "The Classic Burger" with lettuce, tomato, pickles and special sauce to the "Medi-terra," a lamb burger with charred peppers and onions, manchego, tempura lemons, arugula and cilantro. Soups, salads, sandwiches and sides (onion rings, hand-cut fries, poutine, etc.) round out the menu. For dessert, sip a float or milkshake made with Snoqualmie Ice Cream.